The rainy season is back once again and it's gonna be hard to have your clothes dry. I don't usually use my washing machine's dryer to wring them all out, for my mom always tell me that it's best to hang all the washed clothes outside the house to ensure that all of my skirts, dresses and shirts are all dry. But whenever there are sudden downpours and rains around the Metro, I had to admit that it'll be a hassle getting all the clothes from outside and thinking on where to put it. During the sudden rains, I worry on the soiled clothes, and hanging them all to dry inside the house is a problem. Our house is relatively small, and it's a major burden for us to create one to become a makeshift clothesline. I think having this one is convenient for us, especially during the rainy season. 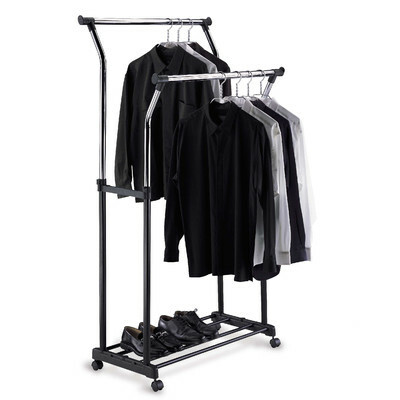 The two-way clothes rack is an great addition to the house, and it's usable in so many ways especially at this rainy state. It can be used as a temporary space for ironed clothes and as an in-house clothesline. It is also durable and strong for it can hold lots of jackets, clothes, dresses and many more. And because of its mobile features, it can be moved anywhere everywhere around the house. I'm finally convinced that I'll be getting the portable clothes rack from Metrodeal after reading the features from their website. I went to visit their website and buy the product in an instant. I followed the directions that is indicated in the website and waited for a week to have it delivered to our house. After I had it received and assembled, It makes me think that it's all worth the money. It really is helpful in so many ways, especially at times like these. I tried using these one time after a sudden thunderstorm hit our place. Good thing that I got our laundry before it rains really hard. After getting the clothes from the clothesline, I immediately use the clothea rack and to have all my clothes air dried for the entire night. It doesnt take much space and I don't have to worry on my almost-dried-up clothes hanging everywhere. Ergonomic design, great product, useful features, reasonable price. I am so glad that Metrodeal has this product posted on their website. So happy indeed!